What value does LinkedIn bring to your business, and what are the LinkedIn statistics that will help you perfect your marketing strategy on LinkedIn in 2019? If your brand yearns for a focused and professional alternative to the harsh and oversaturated vitriol of 2019’s social media landscape, then LinkedIn is for you. (There’s also a summary at the end if you’re in a rush, but you’ll definitely get a lot more from it if you go through each section). That’s an incredible growth rate. From 467 million users in Q3 2016 to 590 million by the end of 2018. Or 123 million users in two years. Compare that to Twitter, which only gained 9 million users in the same period. (From 317 to 326 million users between Q3 2016 and Q3 2018). 2. 260 million LinkedIn users are logging in each month. LinkedIn’s monthly active user base reached 260 million in March 2017. That’s almost 2.5x the 106 million monthly active users last reported in 2016. This number comes from research conducted by web usage company Apptopia and has not been confirmed by LinkedIn. 3. 40% of monthly active users use LinkedIn daily. Of those using the platform monthly, up to 40% are accessing it on a daily basis. If that is the case, that’s over 100 million professionals you could be targeting every single day. To make that even more excited, LinkedIn users typically use the platform to find relevant content, meaning they’ll be much more willing to check out what you’re sharing. By Upper management, we mean directors, vice presidents and the C-suite. 5. 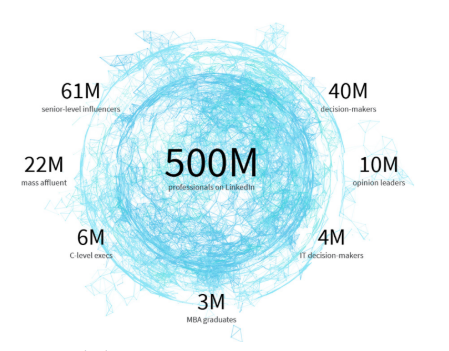 LinkedIn’s reported user goal is 3 billion. LinkedIn CEO Jeff Weiner has said he wants LinkedIn to be the home of all working professional across the world, and be the central hub for every job posting across the estimated 70 million companies worldwide. As of right now, that number works out to around 3 billion people. This percentage is actually low when compared to Facebook (88 percent of activity is on mobile) or YouTube (70 percent). That said, this percentage is still large enough you’ll want to ensure your content—links, forms, and especially video—is optimized for mobile. 7. LinkedIn is the most-used social media platform amongst Fortune 500 companies. Another B2B statistic from LinkedIn’s Marketing Solutions Blog that should definitely interest you. This just serves as further proof that LinkedIn is the place to go to reach your ideal customers and clients. 8. Of the 2 billion Millennials globally, 87 million of them are on LinkedIn. According to LinkedIn and Adweek, Millennials make up a huge chunk of LinkedIn’s total user base. Like it or not, Millennials are the pillars of the future (and present in some cases). As a B2B marketer, this should be seen as a great opportunity to get in front of them now. 9. Of those 87 million Millennial users, 11 million are in decision-making positions. You simply cannot ignore Millennials, and you don’t necessarily have to crack the Snapchat marketing code to reach them. There are 11 million Millennial decision makers on LinkedIn. That makes it entirely possible to get to the Millennials holding buying power without touching Instagram or Snapchat. As LinkedIn expands beyond recruitment, many brands are using it to grow relationships and reputation, court leads, and stay informed. If you’re already investing in content, integrating it into your overall LinkedIn marketing strategy is a Must!. 11. LinkedIn profiles with photos get 21x more views and 36x more messages. The decision to include a photo or not isn’t much of a decision at all in 2019. Profiles with photos get significantly more views, messages, and results than generic, picture-less folks. Don’t think your profile picture absolutely must be an expensive, professional headshot either – as long as you have a picture, you’re on the right track. LinkedIn’s algorithm prioritizes high-quality posts. So, yes, multimedia-rich posts are more likely to perform well. Video posts also earn three times the engagement of text-only posts. 14. There are 9 billion content impressions in the LinkedIn feed every week. Every single week, content in the LinkedIn feed is seen 9 billion times. Which is about 36 billion impressions per month and 468 billion annually. You need to share contents consistently. 15. Only 3 million users share content weekly. Of the 500 million total LinkedIn users and 250 million monthly active users, only 3 million share content weekly – That means 3 million users are getting 9 billion impressions each week. Enough reason why you should start sharing contents weekly on the platform. 16. LinkedIn makes up more than 50% of all social traffic to B2B websites & blogs. More than 50% of all social traffic to B2B sites comes from LinkedIn. Collectively, LinkedIn, Facebook & Twitter drive 90% of social traffic to B2B sites & blogs, with more than half of that traffic comes straight from LinkedIn. Facebook and Twitter may have more monthly active users, but LinkedIn clearly separates itself as the go-to for B2B content distribution. When it comes to lead generation, LinkedIn has been the undisputed boss for years. Ease of use is an important factor, as is credibility. Your leads can research about you with just a few clicks, and see your endorsements and connections. Meanwhile, LinkedIn’s search function has impressive granularity when it comes to narrowing down your desired audience. It can help you search for digital marketing managers or CEO of a company. 18. 92% of B2B marketers include LinkedIn in their digital marketing mix. Are you looking to follow what expert B2B marketers are doing? Then you need to start with LinkedIn. 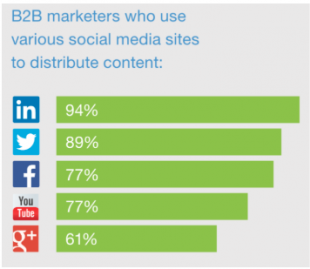 In terms of what channels are included in their content marketing mix, 92% of B2B marketers listed LinkedIn. Twitter was next at 87%, then Facebook at 76%, YouTube at 67%, and Instagram at just 15%. The best B2B marketers have bought into LinkedIn’s potential and they are currently harnessing it with great rewards. LinkedIn says that 10 to 25 percent of InMail receives a response. As a communications channel, InMail is incredibly undersaturated. People who receive hundreds of emails and text messages a day might only receive two or three InMails. You can also buy “sponsored” InMails to target leads. LinkedIn promises each person will only receive one sponsored message every 45 days, meaning your message is very likely to get noticed. 20. Long-form content gets the highest shares on LinkedIn. OkDork.com dug into viral LinkedIn posts to hunt for trends on what type of content performs the best. His findings are game-changing. His results showed 1900 word articles got the most shares, so aiming for between 1700 & 2100 words should give your content the required boost. 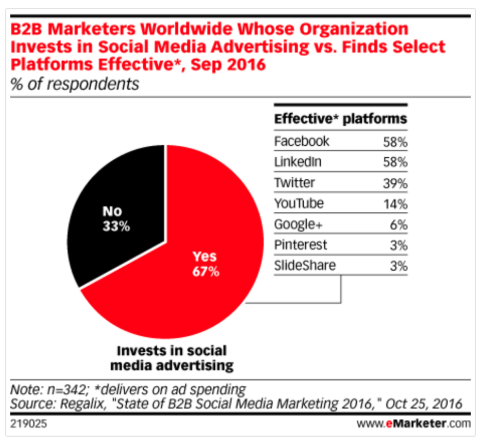 According to a survey of B2B marketers who buy paid ads on social media, Facebook and LinkedIn are tied as the most-performing platforms. 22. How-to & list posts perform the best on LinkedIn. OkDork also found that how-to posts get almost 2x as many views as question posts. When you’re creating content with LinkedIn views in mind, you should focus on how-to posts and list style posts and steer clear of question posts. 23. Posts split into 5, 7, or 9 headings perform the best. There’s a belief that content consumers subconsciously prefer odd numbers. OkDork’s findings pretty clearly support that belief. Whether you’re creating a list-style post or not, keep it to 5, 7, or 9 headings. 24. LinkedIn has a perfect Moz domain authority of 100. Moz’s domain authority is a score a website gets out of 100 to reflect how a search engine ranks them. LinkedIn has a perfect 100, which means Google loves them so much. The benefit for you as a B2B marketer and content creator is that every article you publish on LinkedIn is indexed and will show up in Google searches, with that domain authority giving you the best over other native content rankings for the same keywords. These helps you search engine optimization efforts. 25. 80% of B2B leads come from LinkedIn vs. 13% on Twitter & 7% on Facebook. This one stat alone should be enough to convince you to start investing your time in LinkedIn as a B2B marketer. Of all B2B leads coming from social media, LinkedIn is responsible for 80%. That’s 9 out of every 10 leads coming from LinkedIn. All other platforms combined make up less than 20%, including Facebook and Twitter. Fewer users definitely do not necessarily mean fewer B2B leads. 26. 79% of B2B marketers see LinkedIn as a good source for generating leads. This is one of the most important linkedin user statistics, Given that 80% of all B2B leads come from LinkedIn, this number probably seems quite low. Still, the majority of B2B marketers look at LinkedIn as a great place to generate quality leads for their business. You should too. 27. 59% of B2B marketers say LinkedIn generates leads for their business. Of a group of B2B marketers surveyed, 59% were able to confidently say LinkedIn is generating leads for them. That number would quite likely be even higher if not for the 33% who were unsure on where their leads were coming from. Regardless, LinkedIn is still twice as effective than Facebook and Twitter both. Have any LinkedIn User Statistics to share? Post them in the comments below!